I came across On Education when I returned to university to complete my undergraduate degree after a two year absence. I quoted it in nearly every essay I wrote for the rest of my time as an undergraduate. I had read The Educated Imagination as a teen and then again as a frosh, but did not understand it. But when I found On Education, I found something I could understand because it was essentially practical, even ethical. Not that I understood it all immediately. The remaining essays I wrote as an undergraduate had, beside the exploration of their primary subjects, the secondary agenda of coming to understand this little book of Frye’s. It was with On Education that I began my stack of index cards, and it still dominates that stack. But the roots of my involvement with Frye’s thinking on education are even deeper than that. My grade twelve high school English teacher, Mr. Madill, handed out an article by Frye that appeared in the Toronto Star (Jan 26, 1986) called “Don’t you think it’s time to start thinking.” I still have it. The article is a humble little manifesto that I am sure Frye tossed off in twenty minutes, but it has in no way been superseded by anything I have read or thought. It is still the definitive articulation of my own views. The only thing I would add to this is that the verbal formulas can become arbitrarily sophisticated without ever breaking into thought. There does seem to be a certain intangible moral element in education, as there is in everything. I suspect this intangible ultimately has something to do with whether we care for the truth itself or only our own possession of it. If we are willing to be wrong so that the truth can be right, I think we are on the right track. It’s hard to imagine Frye’s own verbal formulas being thrown up as a pretence of thought, but if Frye ever becomes as influential as he deserves to be, the false intellectuals of the world will certainly use him as they use whatever else commands authority. I suppose what I am getting at is a defense of my more traditional idea of truth which certainly ties back to my more traditional idea of God that I alluded to it my last comment on belief. Frye shows us the necessary path to intellectual liberation, but being necessary does not make it sufficient. There’s an ingredient missing, an absolute, unconditional loyalty to a truth that we can neither have nor be. I don’t think Frye views things this way. 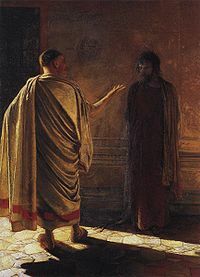 Speaking about absolutes is a step too far for Frye, but I do not see how we can truly think unless we are willing, not only to build on what we have thought, but also dismantle what we have thought, even what we have believed passionately, and that is extremely painful and so requires a detached loyalty to something outside of us. This entry was posted in Education, Literary Criticism on January 5, 2010 by Guest Blogger. We are delighted to post this response by Michael Dolzani on the question of Frye’s anti-supernaturalism. Michael, editor of several of the Collected Works, will be joining us as a byline correspondent. But if the deification of the void is false supernaturalism, it is certainly a valid question whether Frye believed in a real supernaturalism. I am not surprised that this controversy has erupted in relation to Fearful Symmetry, where Frye is closest to Blake. Blake tended to equate “nature” with “fallen world” in a way that sometimes—misleadingly, I think—suggests that he is the kind of Gnostic who rejected the physical world altogether. That cannot really be true: a bird cannot be a world of delight closed to our senses five if it is merely fallen or illusory. But Blake is pushed in that direction by his repudiation of “natural religion,” all the more so because most of the conventional Christianity of his time and ours is really natural religion in disguise. Natural religion is what happens when the “natural man” [1 Corinthians 2:14], Paul’s term for the fallen aspect of ourselves, tries to imagine the supernatural. The result, as Browning showed, is Caliban upon Setebos, the reason being that the natural man cannot think or imagine beyond the natural. What is the natural? In this context, it is the cloven fiction, the split between the subject and a world of objects alienated from the subject. If the natural man is the subject, God must be the ultimately objectified Object, either projected into the heavens as an inscrutable sky-god (Urizen, Nobodaddy, Shelley’s Prometheus) or into the depths as the Immanent Will of Hardy and his chief influence, Schopenhauer. This is really another kind of deification of the void. Such a God is a Holy Terror, tormenting his followers as he tormented Job, afflicting them outwardly with boils and tragedy, inwardly with the theological nightmares of predestination, the terrors of eternal hellfire, and the intractable guilt of people like Luther. I find that intelligent Christians of good will are puzzled and put off by the anger of people like Blake and Frye. Such Christians are thinking in terms of a God who is, as Clayton Chrusch says, the beautiful hope of those who are suffering. But Frye grew up in the realm of Protestant fundamentalism, and I grew up within pre-Vatican II Catholicism, with the same rebellious result. Frye, especially the younger Frye, refuses to suppress all the troubling questions; like Job, he stands up and cries out for answers. And unlike Job, but like Blake, he refuses to be shouted down because God has a bigger loudspeaker. So the natural man cannot be truly spiritual; he can only be superstitious, worshipping and trying to placate a spook conjured by his own anxieties. But Paul’s “spiritual man” is identified by Blake with the imagination. The imagination does not “believe in” God: belief is concerned with the evidence for or against objects, and God is not an object. God is not a “fact,” at least not in this sense. The natural man thinks that, if God is not a fact, he must be a mere fiction or illusion, but it is one of the primary missions of Words with Power to get beyond that impasse. That is why I think Sara Toth’s essay “Recovery of the Spiritual Other” (in Northrop Frye: New Directions from Old) is an important contribution to Frye studies. Sara observes that, beginning as early as the 1970s, Frye increasingly speaks of a “spiritual otherness.” To the imagination or spiritual man (or woman), God is “other” and yet not objective. In the Preface to Spiritus Mundi, Frye writes, “For Blake and Yeats, on the other hand, there is nothing creative except what the human imagination produces. Stevens polarizes the imagination against a ‘reality’ which is otherness, what the imagination is not and has to struggle with. Such reality cannot ultimately be the reality of physical nature or of constituted human society, which produce only the ‘realism’ that for Stevens is something quite different. It is rather a spiritual reality, an otherness of a creative power not ourselves; and sooner or later all theories of creative imagination have to take account of it.” Autobiographical aside: my first contact with Frye was in 1976. At the age of twenty-five, I wrote him a fan letter thanking him graciously acceding to my visiting father-in-law’s request to autograph a copy of Spiritus Mundi for me. In my letter, I specifically mentioned the “spiritual otherness” passage as seeming like a fascinating new direction for him. He wrote back saying that he was working on a book on the Bible, and that this was one of the issues it was important to get right. This entry was posted in Cosmology, Guest Bloggers, Imagination, Intensified Consciousness, Literary Criticism on January 5, 2010 by Guest Blogger.